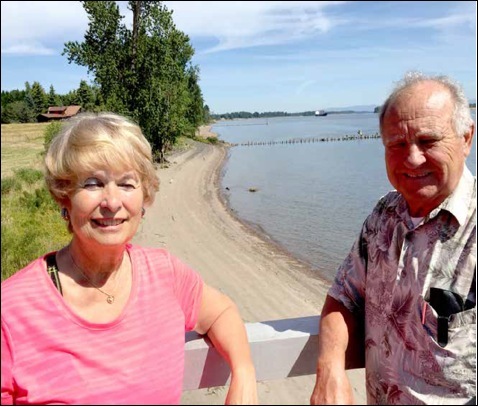 The Army Corps of Engineers sent public notice to a small group of Sauvie Island residents about a plan to dump sediment dredged from the Swan Island Lagoon off Sauvie Island beaches on May 26. By late June, a growing number of Sauvie Island residents had organized letter-writing campaigns and meetings at the local grange hall expressing their concerns. Corps official Michelle Helms said the material to be dredged from the berth of the U.S. Coast Guard Cutter Bluebell was properly evaluated and is suitable for “in-water placement.” But she declined to share the test results from the sediment other than to say they were carried out by a cross-agency group called the Portland Sediment Evaluation Team. It’s the last thing one would associate with Sauvie Island, an idyllic tourist attraction that receives 1.8 million annual visitors, some of whom swim on beaches downriver from the proposed dumping area. That email, from Kristine Koch, an environmental cleanup project manager for the EPA, to Travis Williams, executive director of the Willamette Riverkeeper, appears to confirm fears of Sauvie Island residents who have already brought three local TV stations to the island and are busy writing every government agency and politician they can think of. While relatively small, the 1,000-cubic-yard dredge job reveals some of the uncertainties underlying Portland Harbor Superfund cleanup planning. The EPA’s draft feasibility study will “lay out different cleanup options” this summer, Williams said. The Corps’ comment period closed June 25 for the Bluebell dredge proposal, but island residents say they’re concerned about the Corps’ refusal to share information and limited notification about the plan. Only about eight residents whose homes face the placement area received the public notice, according to Julie and Richard Holmason and Marion Skoro, founder of Marion’s Carpets. “Our membership is very concerned about the health and safety of our community and the wildlife in and around the Columbia River,” says Pam Vetsch, master of the island’s Grange #840. Deeper layers of sediment could be more toxic than those nearer the surface, said Willamette Riverkeeper’s Williams. Some of the most toxic contaminants in the harbor were released decades ago, before modern environmental laws like the Clean Water Act. “If we don’t even have a full characterization of that 5-foot depth, then how can they provide the reassurance to those homeowners that you don’t have more toxic materials below that surface sample, assuming they’re dredging 5 feet in depth?” Williams asked. This isn’t Sauvie Island residents’ first dustup with the Corps. Back in the 1980s, Richard Holmason said, Corps barges would come at night, dumping in the same Morgan Bar area under the glare of floodlights. Local residents “raised hooey” after the dumps impacted beach quality and fishing, and debris started washing up onshore, he said. Julie Holmason has old digital photos of what looked like a pan full of gooey brownies, sludge she said washed up after a Corps dump. Those dumps, however, were from normal Corps chan- nel dredging, not Portland Harbor Superfund sites. “This time, I think we’re raising more hooey,” said Richard Holmason. Northwest Gillihan Road residents who received the notices have been the most active, but an island grange meeting in late June drew 35 people, including some from Hayden Island, Julie Holmason said. The Sauvie Island Community Association is opposing the Corps proposal as well. Helms emphasized that “this is not a Corps of Engineers project; this is a project that we have a regulatory role in.” Though the work itself will almost certainly be carried out by the Corps, which does heavy dredg- ing in the Portland Harbor area, Helms contends the Corps is merely regulating the applicant, the U.S. Coast Guard. “We want to maintain the navigable capacity of the water resources. Part of our role is to maintain that, but we’re also looking to protect aquatic resources,” Helms said. The Coast Guard’s 70-year-old cut- ter Bluebell is a much-loved local vessel known for helping Vanport flood victims in 1948 and generations of service maintaining buoys on the Columbia, Willamette and Snake rivers. Responding to islanders’ concerns, the Coast Guard and Corps staff set up an informational meeting July 1 downtown, Helms said. Julie Holmason said islanders were told the meeting was limited to 10 and was for Sauvie Island residents only. While Helms said the Corps is following its normal testing and notification procedures, she admits this project is unique. Islanders’ skepticism is partly based their history with the Corps. “Based on past evidence, the Army Corps of Engineers has given me little faith in their ability to follow through with their stated commit- ment to clean up, or cease work if ‘indications of contamination’ are observed,” said Gillihan Road residents Don Young and Martha Berndt. “They’re gonna have hell if I find junk in there,” said Skoro in his Croatian accent, still imposing at 76. Sitting in his spacious riverfront mansion, Skoro showed a reporter photos of the sturgeon he’s caught— one of which he claims was 14 feet long. He said the river was at its lowest point in his quarter century of observation, echoing Holmason’s concerns that dumped sediment often does not wash downriver as the Corps plan describes. A state Fish and Wildlife official did not return a phone call about the reference by deadline, but Williams suggested that spring Chinook and winter steelhead could be affected. Some Sauvie Island residents fear Sturgeon Lake habitat could be impacted. Beyond its character as a tourist destination, or less-publicized culture of wealthy retirees, Sauvie Island residents’ love of the river is paramount. Previous Previous post: Joey Bada$$ about to earn his hip-hop Ph.D.